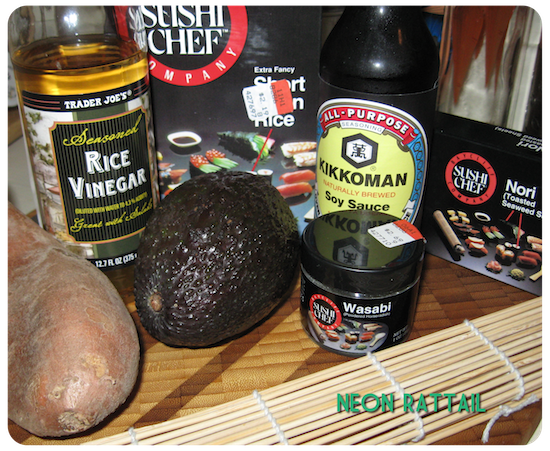 note: these ingredients are available in the Asian foods aisle at most regular grocery stores. 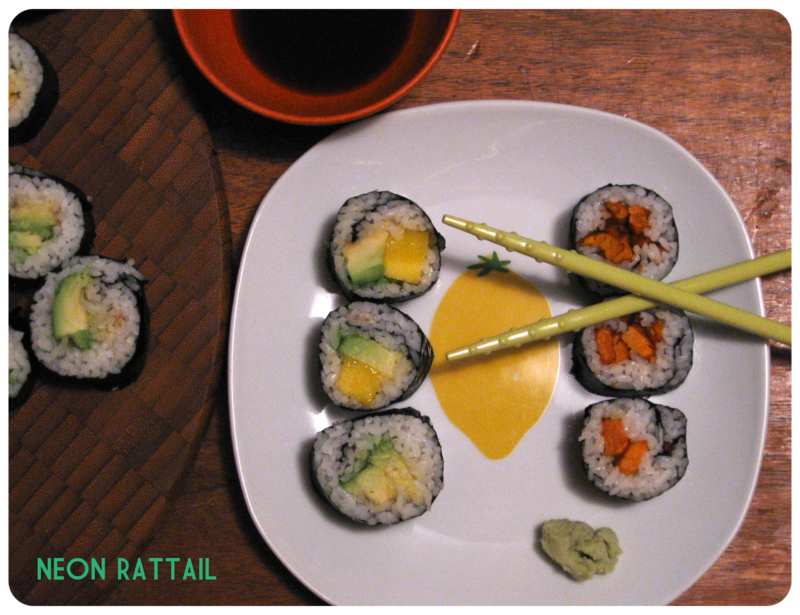 Prepare sushi rice according to package directions. 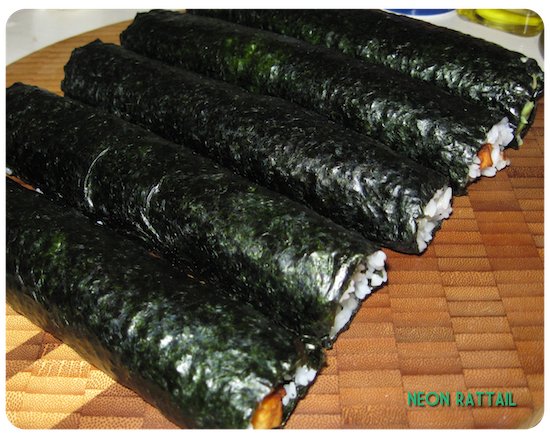 For 5 rolls (a whole package of nori sheets) I use about 2 cups of rice and 2 cups of water. When cooked, add 1 TBSP or so of seasoned rice vinegar into the rice and mix. Peel, chop and prep any veggies you are using for filling. 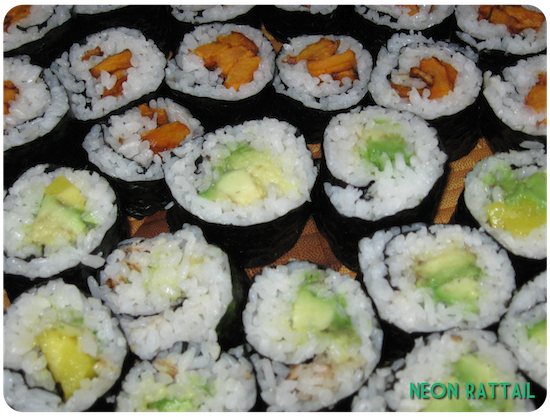 I chopped the avocado and mango into about 1" pieces. I then chopped the sweet potato into about 1/2" pieces and fried it lightly in veggie oil for about 5 minutes, until soft on the inside and crispy on the outside. Lay one nori sheet (shiny side down - yes, both sides are shiny, but one is shinier) lengthwise on top of the bamboo rolling mat. 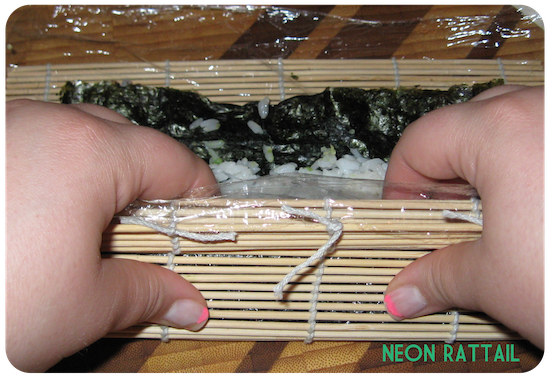 I lay a piece of plastic wrap on top of the mat before placing the nori because it makes for easier cleanup. 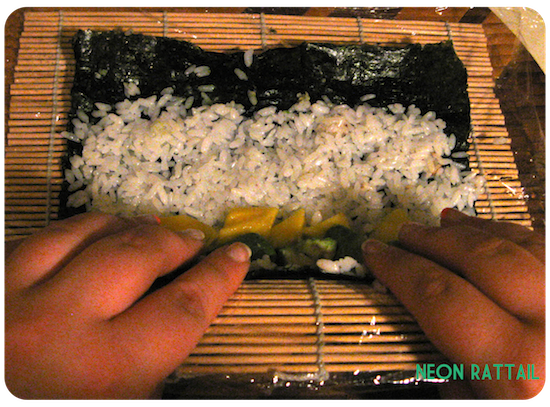 Place the sushi rice on the nori sheet , covering it about 75% of the way with a thin coating of rice. Leave the rest of the sheet empty at the end furthest from you, as this part will be used to "seal" the roll when you're done. 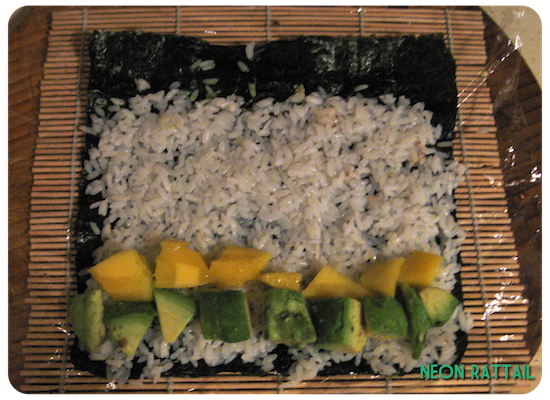 At the end closest to you, add your veggies in a line across your nori, right on top of the rice. If you have more than one veggie add it in another row above the first veggie. Are you still with me? Good! Now all you need to do is cut those rolls up. Place one roll on a cutting board and get your knife (super sharp is best) a little wet with a water soaked paper towel. This helps it cut into the nori more easily. Cut each roll into six even pieces. I usually cut it once in the center and cut each half into three pieces to make it a little easier. The smoother the cut the better, but sometimes a gentle sawing motion is needed. Pile up those pieces on a plate and enjoy with soy sauce, wasabi (I made mine from Sushi Chef brand wasabi powder) and/or pickled ginger. Enjoy!